The Angels are an Australian rock band which formed in Adelaide in 1974 as The Keystone Angels by John Brewster on rhythm guitar and vocals, his brother Rick Brewster on lead guitar and vocals, and Bernard "Doc" Neeson on lead vocals and guitar. They were later joined by Graham "Buzz" Bidstrup on drums and vocals, and Chris Bailey on bass guitar and vocals. In 1981 Bidstrup was replaced on drums by Brent Eccles. Their studio albums on the Kent Music Report Albums Chart top 10 are No Exit (July 1979), Dark Room (June 1980), Night Attack (November 1981), Two Minute Warning (November 1984), Howling (October 1986) and Beyond Salvation (February 1990). Their top 20 singles are "No Secrets" (1980), "Into the Heat" (1981), "We Gotta Get out of This Place" (1987), "Am I Ever Gonna See Your Face Again" (live, 1988), "Let the Night Roll On" and "Dogs Are Talking" (both 1990). In the international market, to avoid legal problems with similarly named acts, their records have been released under the names, Angel City and later The Angels from Angel City. The Angels have been cited by Guns N’ Roses, and Seattle grunge bands Pearl Jam and Nirvana, as having influenced their music. Neeson left the group in 1999 due to spinal injuries sustained in a car accident and they disbanded in the following year. Subsequently, competing versions of the group performed using the Angels name, until April 2008 when the original 1970s line-up reformed for a series of tours until 2011, when Neeson left again. Alternative versions continued with new members. The Angels were inducted into the ARIA Hall of Fame in October 1998 with the line-up of Bailey, John and Rick Brewster, Eccles and Neeson. Australian musicologist, Ian McFarlane, declared that "The Angels had a profound effect on the Australian live music scene of the late 1970s/early 1980s. [They] helped redefine the Australian pub rock tradition... [their] brand of no-frills, hard-driving boogie rock attracted pub goers in unprecedented numbers. In turn, The Angels’ shows raised the standard expected of live music. After 20 years on the road, the band showed little sign of easing up on the hard rock fever." Chris Bailey died on 4 April 2013, aged 62, after being diagnosed with throat cancer. 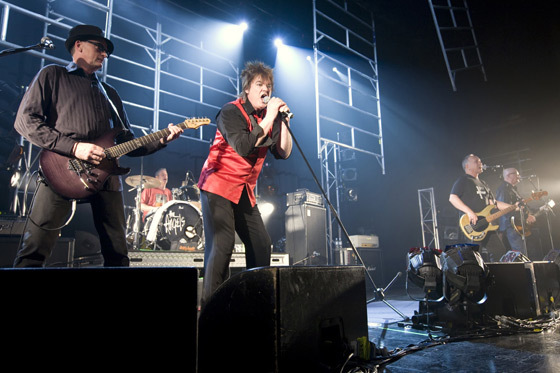 Doc Neeson died on 4 June 2014, aged 67, of a brain tumour.